There's a bit of a mystery here determining a precise date. The "Non-Residents Register Here" sign at the Chamber of Commerce offices in the Mt. Hood Hotel make me think it is a wartime image. The sign advertising the American Legion climb on July 16-17 leads me to pre-war 1938. The license plates are blurry, but the number position and shade matches these years: 1938 and 1940. But the automobiles look postwar to my eyes. Can the HHR sleuths come up with a more precise date for this image? If it was a prewar 1938, what was the nature of non-resident registration? I think there's some important history hidden in this image. I guess I should mention we're looking west on Oak Street from about First, right in front of the Mt. Hood Hotel. Herman Kresse's name is on the drug store at 2nd and Oak, Dr. E.J. Ivie has a shingle out over the hardware store, and Dude's Tobacco and Candy seems to be doing brisk business. Cars are definatly pre war.. I would like to know the address of the first Safeway and first Penneys, I believe both were in the middle of the block on Oak Street. Safeway is now in their fourth location in HR. I think the first Safeway was in the block where Andrews Skylight Theater is now. When I came to HR, Penney's was where Stave & Stone , Kyle & Jill House's new wine tasting, wine purchases, & great venues are now. The other 1/2 is a nice HR crafts store with beautiful items. Yes, the very first Safeway I recall was there in the block of Andrews Pizza. 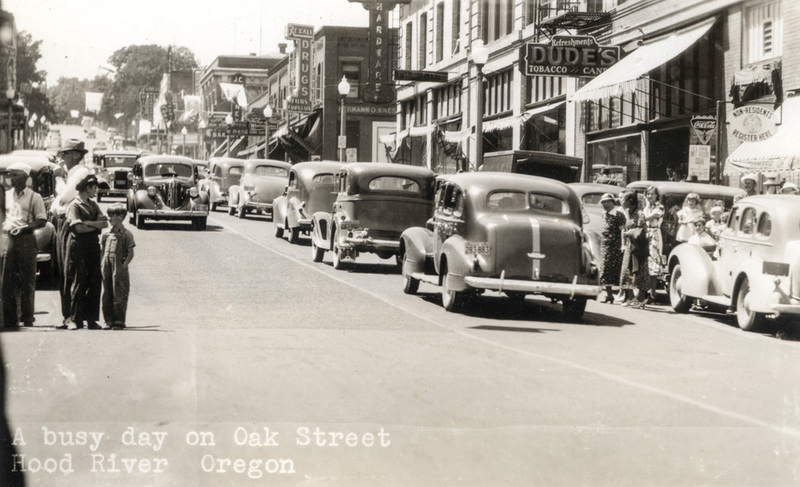 Garrabrant's Chevrolet was also in that block, then Safeway moved down to where Pietro's is, then up to the Hood River News building and finally out to the west end. As to Garrbrant's I remember having to be very careful when you walked past the car entrance as you never knew when one was going to come zipping out. Thanks Charlott for your memories. I think I remember the "Pencil Man". I have googled around trying to find out something about, "Non Residents Register Here." Not able to come up with anything. In September 1940 the U.S. institutes the first draft during a peace time. In 1937-38 there are some things going on with Bonneville dam which included registering. Is the day the 4th of July? LE, I suspect this is July 4th too. There are lots of people hanging around in the street, like a parade has just passed or is due soon. I found a La Grande postcard with the same "Non-residents Register Here" sign. It has a State of Oregon seal on it. Looks like downtown 'traffic' has been around a long time!